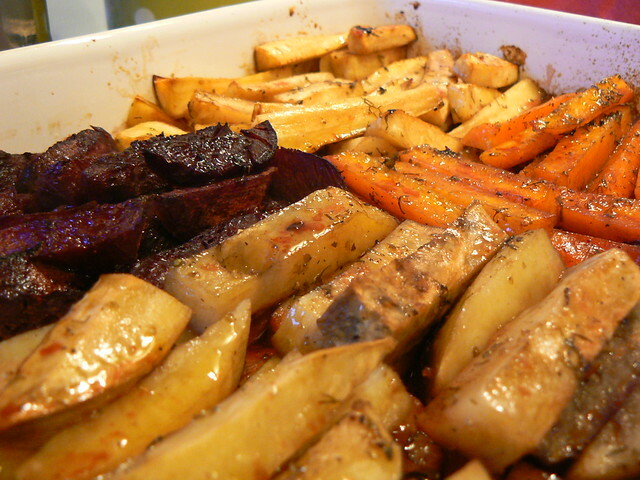 …a recipe for roasted winter vegetables that I had always wanted to try, where more common roots such as potatoes, carrots, turnips and beetroots are combined with the exotic sweet potato, and the newly fashionable swede and parsnip. All I had to do was go to the market to find them. I have always been intrigued by the so-called «forgotten vegetables», such as Jerusalem artichokes, swedes and parsnips: they have this horrible reputation, and as a result I had never tried them. Actually, they are so unpopular on French market places that I didn’t even know what they look like! I learned later that, during the Second World War, those vegetables came to replace potatoes, which were requisitioned by the German forces. After six difficult years, people had become so fed up with those second best vegetables carrying bad memories that they were gladly forgotten for the next half century, until they were rediscovered as heirloom vegetables and made popular again by some chefs. My cousin’s husband has roots in England, where parsnips seem to be more popular, and he served oven-roasted parsnips that melted in my mouth with a delicate sweet flavor for Christmas dinner. Then I encountered the unusual and subtle taste of Jerusalem artichokes in a Budapest restaurant that paired them with walnuts in the creamiest soup I’ve ever had. There was definitely no reason not to remember those forgotten vegetables! The Gourmet Potluck, given to me by my friend Nina, actually had a recipe for roasted winter vegetables that I had always wanted to try, where more common roots such as potatoes, carrots, turnips and beetroots are combined with the exotic sweet potato, and the newly fashionable swede and parsnip. All I had to do was go to the market to find them. After asking around, I realised that the root I thought was a bigger and a bit more crooked sort of parsley was actually parsnip, and that those small, round tubers were Jerusalem artichokes. I haven’t found any swedes though, but I have only rarely seen turnips on Croatian markets, so maybe this type of roots just isn’t popular here? Sweet potato was not that exotic in the end, as it came all the way from… Slavonia. I used to hate the oily betterave à la vinaigrette from the school cantina as a kid, but beetroot has become my winter staple when I moved to Croatia and discovered you could grate it and eat it raw in a crunchy salad. As for carrots, I always have them handy in my fridge because there are so many things you can do with them. Shopping was done, so I got to the recipe. I needed a couple of trials in order to get what I wanted: sweet, almost caramelised, tender roots that make a very seasonal and good-looking side dish. I find it works best with the sweetest roots, such as carrot, beetroot, sweet potato and parsnip, paired with onion, but potatoes and Jerusalem artichokes also work well. Basically any combination will do according to what you find in your fridge! The colours in that dish complement each other well, especially if you can find purple potatoes (sadly, I haven’t) or if you use red onions or shallots, so I do not mix them all together to prevent the beetroot turning everything purple red. Preheat your oven on 200 ºC and oil an oven-proof dish (ideally it should have a lid, but it also works without). In a bowl, mix the oil and vinegar, then add the honey and stir well until it’s completely dissolved. Add salt, pepper and the herb or herbs. Peel the roots and cut them in sticks, about 1 cm large and half as thick. Peel and cut the onions in wedges. Working in batches if necessary, transfer one type of vegetable in the bowl and stir to coat well, then arrange in the dish. 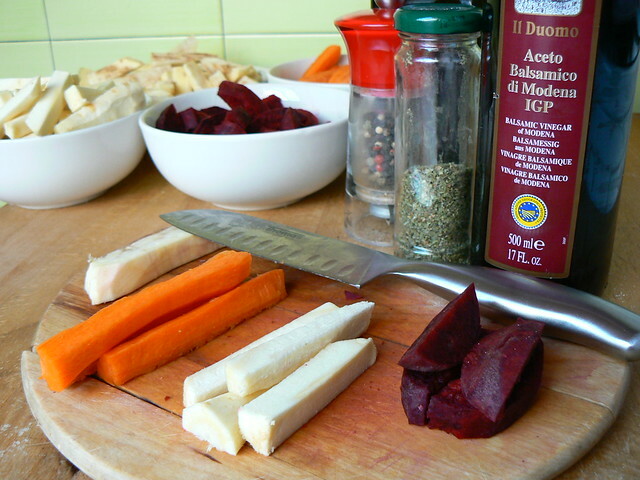 Repeat with each vegetable adding more oil if necessary, and finishing by the beetroot. Place in the oven, covered with the lid, a sheet of foil or of baking paper. After 30 minutes, check if the roots are cooked through by piercing them with a knife. Try each type of vegetable since beetroots, Jerusalem artichokes and sweet potatoes are harder and need to cook longer than carrots and potatoes for example. Leave longer if they need to. Remove the lid, raise the temperature to 220 ºC, turn on the grill and cook for another 10 minutes until the vegetables are golden and caramelised. 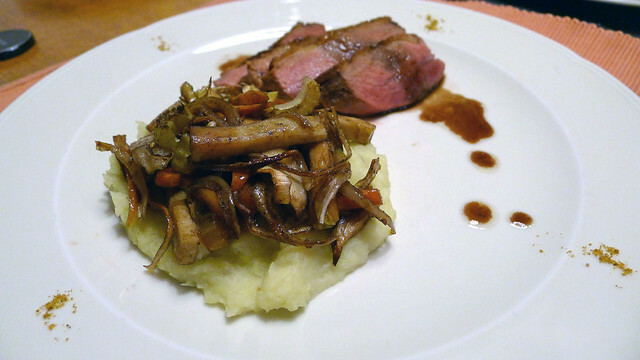 Here is how Goran has put this delicious sidedish on top of celery and potatoes puree and served everything with slowly fried magret de canard. I hadn’t realised that Swedes had become fashionable. Whenever I try to get them, for making Cornish Pasties, I’m told that they feed them to the animals. Jerusalem Artichokes certainly make good soup and a good mash. Parsnips I see regularly here. They are a common accompaniment in the UK to the Christmas roast dinner. We always had them and consider that they are at their best after the first frosts.